Small tree, native to Somalia. The dried resin (Frankincense) is used in incense, perfumes, and medicinally. 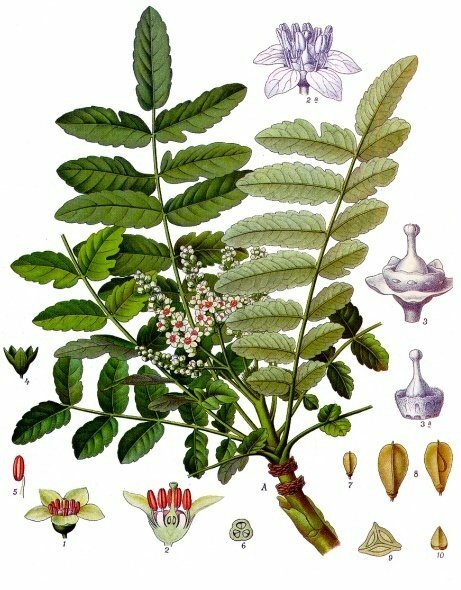 Major components of the pale yellow essential oil of Boswellia carteri resin (hydrodistilled) were (+)-α-thujene (1.7%), (-)-α-pinene (10.9%), camphene (1.0%), sabinene (0.7%), β-pinene (0.7%), myrcene (0.5%), hexyl acetate (0.3%), p-cymene (1.4%), Z-β-ocimene (0.4%), E-β-ocimene (1.7%), (-)-limonene (1.5%), 1,8-cineole (1.2%), 1-octanol (11.9%), (-)-linalool (2.1%), α-pinene epoxide (0.5%), trans-verbenol (0.4%), terpinene-4-ol (0.4%), octyl acetate (39.3%), (-)-bornyl acetate (2.2%), geranyl acetate (0.4%), E-nerolidol (0.2%), cembrene A (2.1%), cembrene C (0.1%), verticilla-4(20),7,11-triene (6.0%), incensole (1.0%) and incensole acetate (2.3%). Main volatile components of B.carteri resin detected by headspace SPME-GC/MS were α-pinene (6-22%), limonene (10-22%), β-caryophyllene (6-16%), caryophyllene oxide (2-13%), β-myrcene (4%), and α-humulene (1-5%). Isoincensole and its acetate were present at 1.4-2.1%. Main components identified in B.carteri oil were α-pinene (15.1%), myrcene (8.2%), limonene (18.2%) and α-cedrene (6.1%). 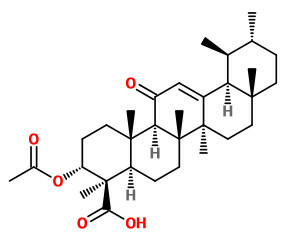 The (1S,2S)-(+)-trans- and (1S,2R)-(+)-cis-2-octylcyclopropyl-1-carboxylic acids (olibanic acids) were detected in ppm amounts in all extracts obtained from B. carterii. These acids provide the very characteristic old churchlike endnote of the frankincense odor.